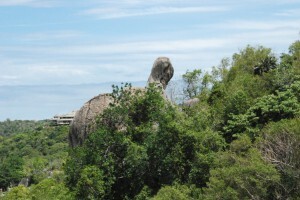 This turtle-shaped stone is viewable from The Fisherman’s Villas. Koh Tao or เกาะเต่า as it is written in Thai, is a small paradise island located about 70 km east off the coastline between Surat Thani and Chumphon, in the Gulf of Thailand. In size it’s a little more than 21 km² stretching nearly 8 kms from north to south. Around 2 000 people live on the island. In English Koh Tao means ”The Turtle Island” as the island originally was inhabited by turtles and also bears the shape of a turtle (when viewed from neighbouring island Koh Phangan). The nature is beautiful both above and below the water, with its stunning coral reefs and rich marine life in the clear, warm water, which attracts thousands of visitors every year. Koh Tao is an unforgettable destination for divers, adventurers, and other travelers, but it is also a perfect place for the traveler seeking for a relaxed atmosphere and lifestyle. Koh Tao has evolved in many ways over the years and is now one of the world’s leading centers for dive training. 18th of June 1899 His Majesty King Chulalongkorn-Rama V, visited Koh Tao and let carve his initials into a large boulder at the south end of Sairee Beach. It is now a place of worship for both local residents and visiting Thai people. Until 1943 Koh Tao was uninhabited and there were only fishermen with their boats that came around the island to locate fish. The island was a jungle with an abundance of turtles and large flocks of different varieties of pigeons. Between 1943 and 1944 the island was used as a political prison. The prison was located in the area of Mae Ban in a range of 35 rai. There were fifty-four political prisoners with fifty other inmates and fifteen guards. According to the prisoners, the island was a living hell with sharks in the water and a daily struggle for survival. Malaria was widespread and they often had to starve. In 1944, all prisoners were freed and returned to the mainland and left the island abandoned yet again. The twin brothers Ta Euam and Ta Oh came to the island in 1947 from Koh Samui. They sailed here and were able to clean up the old prison area to build a temporary camp. Later they took their families to the island and settled down on the northern part of Sairee. More people came from Koh Phangan by the time to start a new life on Koh Tao. They lived simply and subsisting on fishing, coconut cultivation, rice fields and orchards. During this time, there were so many turtles on the beaches that several times a year the beaches were completely black. The first travelers came to the island in 1977 to dive and explore the undiscovered and unspoiled underwater world. They came with fishing boats and boats that transported coconuts. In 1984 the first resort of Koh Tao opened in Thian Og Bay (Shark Bay). At this point tourism became the main focus and has since then developed its infrastructure of facilities and a wide range of activities.